The lens markings will usually be in one corner away from the field of vision. 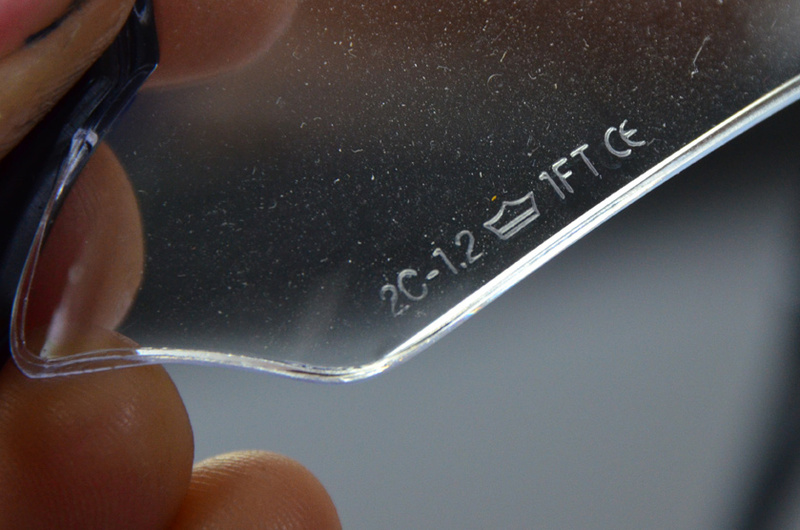 All safety lenses must pass the European EN standard giving a degree of protection. There should also be the mandatory CE mark which indicates they comply with EU safety, health and environmental requirements. This could be at the beginning or the end of the sequence. Next will be a set of numbers that indicates what UV protection you’ll get. Then will be the manufacturers logo or name. In the example here the Crown means the company Bolle. Finally there will be a combinations of numbers and/or letters which indicate to what degree the frames passed the EN test within various categories. Below we’ll look at what these letters and numbers mean and give a couple of examples. The little Crown icon is simply the manufacturers seal. The slightly confusing matter is that rarely will the EN Grade be printed on the lens also. Even more confusing is the fact that a pair of safety glasses can have an EN166 Frame but an EN172 lens. From the list of the different EN Grades below you can determine what protection you get and what you need to request if your company is buying them on your behalf. 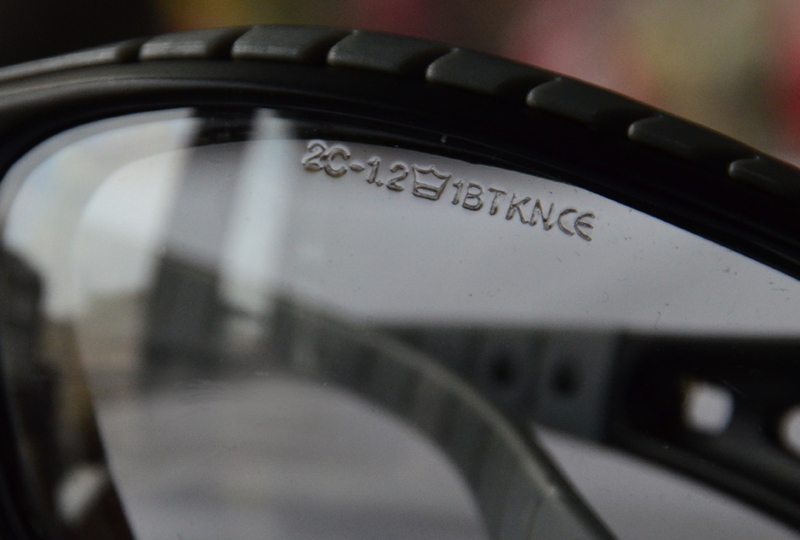 Read on further down the page to understand the specific numbers and letters printed on the lens. EN166 – The core technical performance standard. This basically means it meets the minimum EN standards and will be printed on the frame but not the lens usually. EN169 – Lenses for welding and related techniques. EN170 – Full specialist UV protection. Note that all EN166 glasses will still give a very high degree of protection from UV in normal sunlight. EN170 goes beyond this for industrial use. See the explanation for the “first set of numbers” for the varying grades. EN171 – Infrared protection beyond what you would get in normal daylight. These are for specialist industrial IR protection. EN172 – Full solar radiation lenses giving both UV, IR and glare protection in sunlight. 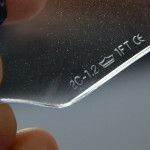 Advice: you won’t see the EN grade marks on the lens so you’ll need to find this on the website, packaging of the glasses you’re looking at. We display all the EN Grades as standard but some websites do not. If you’re smart you’ll be able to use the info below to figure out what Grade the lens falls into just by the marking. These appear before the manufactures logo or name. 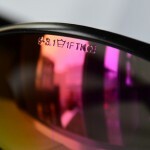 They indicate the degree of solar protection you get from the lenses. The first letter gives an overall indication and then a hyphen will separate another number which tells you how dark they are. Advice: Just by putting a piece of glass or clear material in front of your eye gives you 90% UV. This is why you can’t get sun burnt in your conservatory. The other dangers however are significant which is heat (IR) and sunglare which can cause headaches. If you are working near hot surfaces then you need EN171 lenses marked with “4” and if you are working near reflective surfaces like water or metal then you might consider EN172 lenses marked with “5”. “6” givs both glare and IR protection which is the ultimate I outdoor eye safety. Advice: These numbers simply show how dark the lenses. 3.1 being like dark sunglasses and 1.2 being clear. Note that no lens will allow 100% transmission since they take out most of the UV light. The Cobra HD however has the highest light transmission on the market at 96%. After the first set of numbers will usually be a manufactures mark. A name or a logo. In the example above it is a Crown. You’ll then see a 2nd set of numbers which indicate the lens properties. 1 – The best optical quality. This means the lenses have been developed to a high degree of accuracy and can be worn all day without damaging your eyes. They have a refractive power of ± 0.06 dioptres. 2 – These are 2nd class lenses suitable for occasional wear. A refractive power of ± 0.12 dioptres. 3 – Only suitable for exceptional wear. A refractive power of ± 0.25 dioptres. 8 – resistance to short circuit or electric arc when welding. Advice: Then first number you will see with most likely be “1”. Rarely you will see a lens with a “2” or “3” mark any longer since most manufacturers can easily achieve optical class 1 cheaply with modern processes. Our advice would be to only use glasses or goggles with optical 1 lenses. If your a cutting and there is a chance of hot metal projectiles then look for the “9” since this will be important. The letters are quite straightforward and usually used to describe the strength of the lens from an impact. There may also be “T, K or N” which gives additional properties. Advice: As a minimum you should really be looking for a F rated lens in safety glasses or goggles. “S” is usually a waste of time and you’d probably get that sort of protection from a pair of normal sunglasses. “A” is rarely seen in normal industrial process. We generally say “F” for normal work on a site or in a factory and then “B” when you will be doing specific activities with a high risk of flying projectiles like angle grinding. “T” is also an important factor since it means the above strengths will be maintained in warm climates or hot factory conditions. Finally, most premium safety glasses / goggles will also have an anti-scratch / fog treatment. Bare in mind this is only a treatment and will only give a degree of protection. This lens says 2C-1.2 / 1FT. Firstly the mark “2C” tells you that it has full UV protection to EN170 and the “C” means it won’t alter colour perceptions. It then says “1.2” which basically means it is a clear lens and transmits between 75%-100% of the light. In practice Bolle’s clear lenses transmit over 92%. We then go to the second set of numbers and letters. In this example “1” shows you the lens is optical quality “1” and you can safely wear them all the time. It then goes on to say the lens is “F” rated to withstand small objects traveling up to 45 meters per second. “T” then says that it will still maintain this strength in hot conditions. 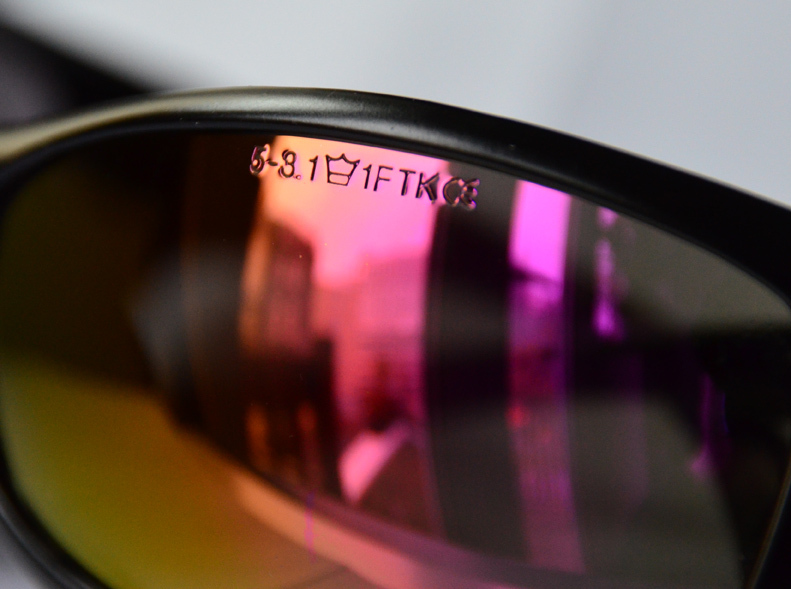 This pair of glasses says it has Solar Protection to EN172 with the marking “5“. So that is full UV and sun-glare protection but not from Infrared. The “3.1” gives the darkness which is maximum for safety glasses and comparable to normal dark sunglasses. They are optical quality “1” with a strength of “F” to protect against small objects traveling up to 45 meters per second. 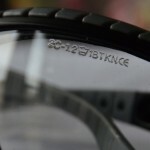 On top of that they are “T” rated for hot conditions and “K” rated to say they have an anti scratch coating. Ok this is quite a complex lens rating. “2C” says it gives 100% UV protection to EN170 with no colour distortion. “1.2” means that it transmits over 75% of light which basically clear. In reality the Tracker transmits over 90% due to the high quality of the lens but the European standard don’t account for quality that high. It then says it is optical quality “1” so can be worn all the time. “B” is a very strong lens giving protection against small objects traveling up to 120 meters per second. you won’t find safety glasses with a rating higher than this. “T” means it maintains its properties in hot temperatures, “K” means anti scratch and “N” means it has anti-mist properties.